So I'm kind of curious about understanding tuber shape and how it is inherited. I've now grown a few wild potatoes, and the tubers are rather like miniature commercial potatoes, small ovoids with fairly smoothish surface features more or less. Some of the Andean diploid types I've grown behave very very differently, with long branching knobby nested complex structures that are some mixture of a single tuber or a concretion of many tiny ones. And the eyes are often sunk deep into the tuber. What are the wild ancestors of tuberosum like? Do they have these concreted tubers with deep eyes, or was that selected as an early feature of domestication. Frankly, while they are interesting to harvest and goggle at when they first come out of the ground, they are not very easy potatoes to use in the kitchen. 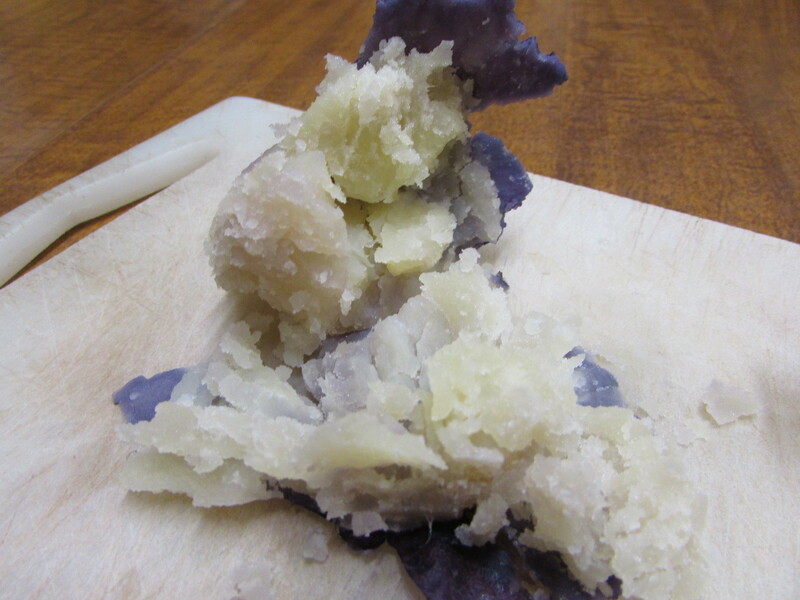 I'd like any resources on traditional cooking methods for crazy potatoes. Here's a picture of 4 different diploid clones. Two are Andean seedlings, top left is a very smooth Chaucha Amarilla Larga seedling from this year, top right is BS 283, bottom is BS 286 and the blue crazy tuber in the center is a Criolla Rosada seedling from this year. It is also the highest yielding seedling I've ever grown, with a huge 5 lb yield of tubers. But they are all crazy tubers that I don't know how to use easily. They are basically unpeelable, and challenging even to wash. If I saved this crazy Criolla Rosada clone, and cross it with nice smooth BS 286, what happens? More crazy tubers? Something in between? What you most likely have there is a short day adapted diploid that has gone long past its normal maturity under long day conditions. The stolon has thickened into a sort of long tuber and then its normal round tubers formed at the nodes later when the day length dropped enough. If you grew it under short days, you would probably get nothing but rounds. I have taken rounds off of tubers like that before and gotten normal tubers from later planting. I have no idea, but you should do it! I have made no inroads to the potato world yet, but i want to. I want to start with diploid varieties first and those that grow well from TPS, and then i can branch out from there. It might be better to start with tetraploids first, but whatever. I really like little yellow fingerling potatoes, but can't seem to find them at the supermarket anymore. I might also like other cool crazy andean colors or traits, so i am open to wide genetic diversity. I found some diploid TPS the other day, so apparently i still have some seed to play with, but i am always open to others seeds! I am also interested in wild species. I have a few pea sized tubers of 'M6' Solanum chacoense and i'm interested in S. jamesii. Remember that diploids are short day tuberizers. That could be a challenge in Colorado. Hmm. That is something worth considering. Diploids are interesting, especially the extreme yellow flesh types- Papa Amarilla and Yema de Huevo, but for growing lots of useful food, tetraploids cannot be beaten. I grow both, but if I could only grow one or the other I'd drop the diploids in a hot second. I'd be interested in any resources/papers related to breeding potatoes for starch characteristics. I am very partial to high dry matter/floury potatoes but most of my seedlings seem to be waxy to medium texture. What are the genetics of floury vs waxy flesh? It is a quantitative trait, so you have to select hard to maintain high dry matter. With so many genes at work, reversion to the mean is a problem. Lots of progeny and relentless selection. You might want to look at getting some chipping type potatoes to cross in, since they are very heavily selected. Some wild species like S. chacoense tend to produce very high dry matter, but also contribute high glycoalkaloids. But, you might look for varieties that have it in the pedigree. Here's another general question regarding selection, I've been thinking more and more about the complexities of potato selection, even on a homestead scale. In John Navazio's book "the Organic Seed Grower" I was really fascinated by his discussion in each crop of how to avoid unintentional selection of negative traits. So I've been thinking about the way in which I have been assessing seedlings and wondering what assumptions I've been making that might be leading to rejecting promising seedlings and continuing with seedlings that are not actually what I'm looking for. The first few years of my TPS seedling growouts, I was always cutting the tiniest microtubers to get a sense of the internal flesh color etc, and I didn't always even do a cooking test of the tuber. I was also preferentially growing out the highest yielding seedlings and rejecting anything below an arbitrary yield cut off. This year has been kind of a bizarre season for my potatoes, as well as a completely freakish weather season for the most part. The weather was fairly normal in the spring, although the growing season started several weeks early, but in July it started raining and essentially has not stopped. My soils are saturated with water, despite this being a gravel soil that is freakishly well drained. Farms in the area cannot get any corn or soybeans off or really do any tillage or similar work without burying their equipment in the pit of despair. For my potatoes, I've had an insanely productive year, both for the seedlings and for harvested berries and TPS yield, and the tuber plot. Yields have been massive, but I've also had significant rotting issues, and serious levels of hollow heart in many of my tuber grown potatoes. It seems from a comment Bill made recently that by selecting to grow the highest yielding seedlings, I was selecting for rapid growth and thus significant risk from hollow heart. So with yields being variable from year to year based on varying weather, where in the spectrum of seedling yield is the sweet spot of maximum productivity and minimum tuber defects/growth problems etc? It also seems to me that the tubers from a seedling differ somewhat from the second and following plants grown from tubers. I'm wondering if Doug Strong style "pull starts" would be more like a seedling tuber or a tuber grown plant from that perspective. Even seedlings that seem to give full yield seem prone to producing more tubers in the seedling grow out than the tuber grown plants of the following generation. Or is that my imagination? It also seems to me that the tubers from a seedling differ somewhat from the second and following plants grown from tubers. I'm not sure there are easy answers. I actually think the longer I've done this, the more subjective I get with my criteria. As you say, weather related changes from year to year do make evaluation difficult in years that seem to be an exception to the norm. I agree with you about tubers from a seedling vs the same plant grown from tubers. Most first year TPS plants last far longer into the season than they will when grown from tubers. That's a difficult thing to evaluate without really grown them out from tubers at least once. Though obviously some are just duds. In 2017 I grew out every 2016 TPS seedling that produced tubers, just to be able to get numbers on evaluating the "what if's" of which ones and what kind of percentages should be saved or culled. I'm wondering if Doug Strong style "pull starts" would be more like a seedling tuber or a tuber grown plant from that perspective. Even seedlings that seem to give full yield seem prone to producing more tubers in the seedling grow out than the tuber grown plants of the following generation. Or is that my imagination? Pull Starts to me seem like tubers grown from clones, but with them skipping the pretuberization phase of growth. Pull Start growing seems to start the process of senescence, and most Pull Starts begin to tuberize immediately. (I've actually wondering whether doing it with sizeable amounts of short day diploids might trigger earlier tuberization in short season climates.) I think there is something going on with Pull Start plants hormonally (or something else biologically? 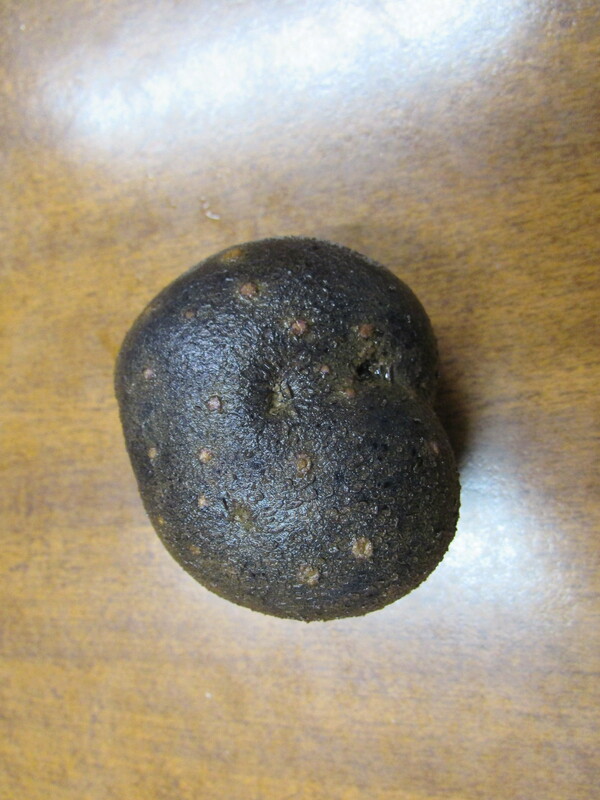 ), that is deficient in something tuber grown plants have. The quantity of tubers is limited to quantity per stem, so plants with many stems produce smaller tubers, but more of them. Simon Smart has done some research about this in his Phd dissertation, but essentially concludes that stem spacing is largely what most impacts yield and tuber size. There is an ideal for yield based upon this, but that probably is different with different varieties. I will tag you in a threat on KPP. Here is the link if you want to download the pdf of his dissertation. Rather than size of the potato seed tuber is the weight that correlates with higher yield. Early emergence correlated to increased canopy ground cover. About 2-3 weeks after emergence the tuber initiation starts. 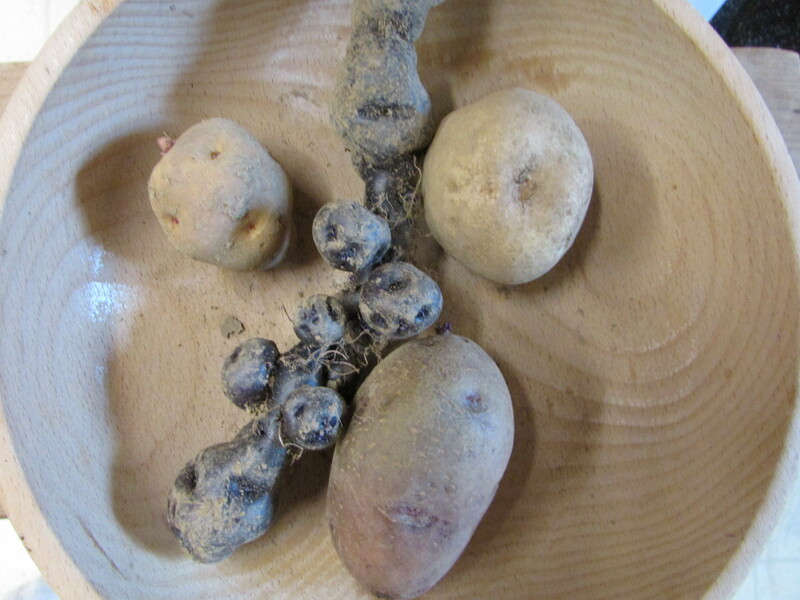 The total amount of tubers is fixed early in the plant development. For those doing pull sprouts there was a mention that removing the seed tuber after stem development decreased yield. Multiple thin stems equal smaller tubers and fewer thicker stems equals larger tubers and stem size/weight is the important element. When the diameter of the stem below ground and the weight of the stem above ground is large then the result is better. Next time I grow potatoes I would select cold stored but chitted tubers for early apical emergence/large canopy ground cover. Weight seed tubers of 2.0-2.5onz and plant them at 12-16in spacing. If they result in 3-4 thick heavy stems per plant cluster then I should get the most uniform tubers+bigger yield. I guess I'll use a recently harvested seedling to kind of discuss my confusion on how to proceed with certain seedlings and how much of a struggle it is to figure out if you should keep a variety or not. This potato is a seedling from a batch of bulk seed collected from my 2017 seedling row of Sarpo Mira X Bulk mix that was crossed by nathanp and he gifted to the KPP seed train. This plant produced 1 pound 12 ounces of these coal purple round tubers. My previous cut off was 2 pounds. I would toss any seedling that yielded below that. When I cooked a tuber of this variety I have generally been steaming them in chunks or whole depending on the size of the tuber. This tuber did this after 10 minutes of steam. I don't exactly understand what is going on with the skin, but it has about the flour-iest, highest dry matter texture of any potato I've ever had. 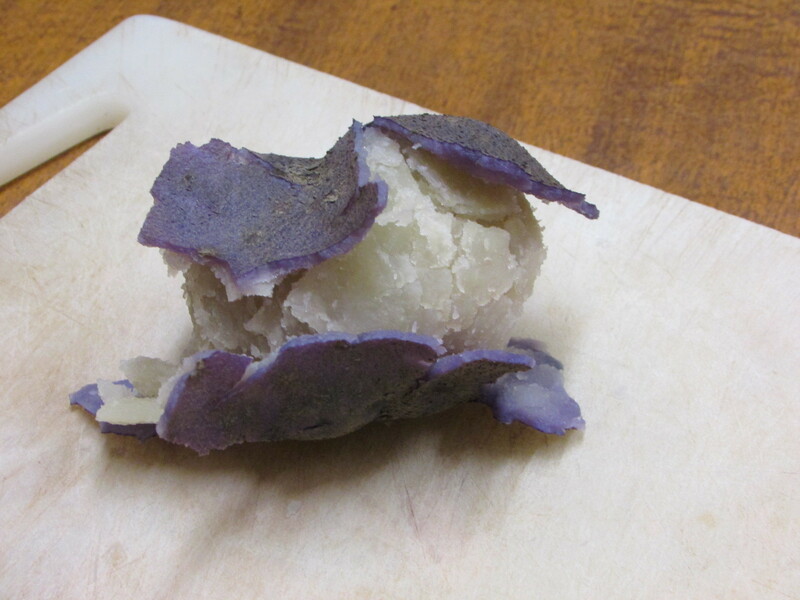 It also has some light purple streaks in the flesh before it is cooked, so the cooked tuber flesh is a bit grey. There are a lot of aspects to this potato that I don't like. I don't like black/purple russets that are shaped just like rocks. They are impossible to see when you are harvesting. I don't like purple tinted/streaked flesh. It looks grey after it is cooked. The skin seems oddly thick but doesn't hold together when cooked in steam. The yield was low. But I LOVE floury potatoes. Shouldn't I keep this one because it is unusual and so floury? I don't know that I would want a huge row of these, but if it is fertile then wouldn't it be possible to breed a better skin color, yield size, crossed to it to make a good potato? Yes, if that has the floury genetics you are looking for. Plant that one next to another one that has those traits, or alternate several in the same row, or in adjacent rows to try to get open pollinated crosses. You can always work on the yield, or select for yield as a secondary trait once you have TPS from something like this. I'd keep it for a while to breed with it. Fast cooking and fluffy, it looks like an excellent dumpling potato. No peeling of hot potatoes is great, just scraping out with a spoon makes life easier. You probably know this, mentioning it just in case, but poke a hole in them when steaming, they explode sometimes if you don't. A very messy experience when you are lifting the pot lock just at that time... I got covered in potato mash last week because I forgot. It does really look like a rock though. It's funny, you got rocks and get rock coloured ones, I got sand and get sand coloured ones. Must be Murphy's potato breeding law. If you have some sibling tubers of that cross, which meet your criteria in colour and yield and show signs of good starch, I'd try crossing it with them. The genes are in there and good starchy varieties for crossing are hard to find, at least in Europe. Most of them are not the best producers, lousy berry keepers or don't have much pollen. I keep two varieties, Mandel and Mehlige Mühlviertler, because of excellent taste. But other than taste and starch they are not exactly great varieties. I get a good amount of earlies when selfing or crossing mid season varieties. Not a lot, but good enough. It's my lazy way to find bonus earlies from other projects. Selfed late season plants or crosses between them seem to give late season seedlings most of the time. Maybe one in 10 could pass as mid season, but no earlies so far. I have not done a late x early cross, but plan to do some next year. Probably things will be all over the place in the offspring, with a tendency towards lateness, but I'll try anyways. Earlies are a pain to breed with in my experience. Selecting for good berry producers might cull them as a side effect. Some years my earlies don't even bother with flowering at all. But they do flower nicely when they are in the right mood. Cool temperatures are helpful. I got 1 berry this year, had about 30 plants with lots of flowers and plenty of good pollen varieties around them. The single berry wasn't fully developed when the plants finished, it had ~10 seeds of dubious quality. Yay. The slightly easier way to breed with earlies is to use their pollen (if they have fertile pollen) and to match up flowering time with a mid season variety. This usually gives me more berries, more viable seeds per berry and a good percentage of early seedlings. From my experience young rootbound TPS seedlings give a lower yield than they could if they had been potted up or transplanted in time. Especially the earlies suffer a lot from that, since they start tuberizing early. I try to avoid rootbound seedlings, but sometimes spring is late and there isn't much to do about it. Those years I typically get something like three biggish tubers from early plants. I give them a second year chance then, if they are keepers in other criteria. Having a high cut off weight for the seedlings would cull those without revealing if they are true low producers or got stopped from being rootbound. I think your cut off weight is good for the late varieties, they usually don't improve weight much in second year for me. But I'd not apply 2 pounds to the earlies, 1 pound on early seedling plants isn't too terrible performance, at least in my growing conditions.